I attended the Northwest Folklife Festival for my fifth time over Memorial Day weekend. This convergence of music, dance, crafts, and food celebrates folk traditions from cultures worldwide, and, with 250,000 attendees, it is the largest community folk festival in North America. It hosts 5,000 performers over four days, and with such diversity, audiences experience a range of impacts. Folklife is not a WolfBrown client, but once I began working with the Intrinsic Impact framework, it has become impossible to not reflect on my experience of the festival in those terms. Intrinsic Impact research is rooted in WolfBrown’s commitment to measure what matters. Arts organizations may be more accustomed to collecting demographic, psychographic, and satisfaction data. However, these are rarely the factors that arts and culture organizations reference when they describe their importance. Instead mission statements, boards, staff, and supporters of organizations talk about how arts organizations transform individuals and communities — the intrinsic impacts of the arts. The Intrinsic Impact framework identifies variables of emotional resonance, intellectual stimulation, captivation, aesthetic enrichment, and social bridging and bonding. These intrinsic impacts are what drive so many of us to work in the arts. Therefore, the need for a measurement approach that allows us to understand not only who is in our audience, but also the impact of their experience, is clear. 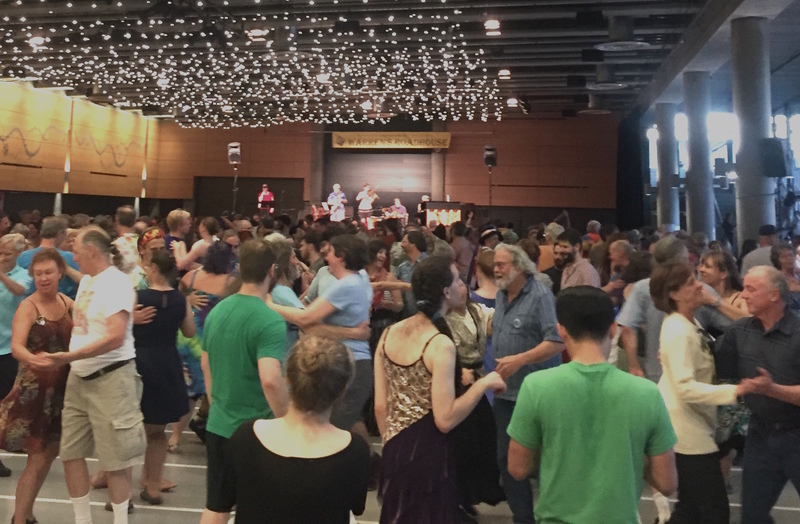 Contra dance at the 2017 Northwest Folklife Festival with Susie Kendig calling and music by Wild Hair. I spent most of my time at the Folklife Festival in Warren’s Roadhouse, where hundreds of dancers frolic through contra dances. Contra dance is a participatory folk dance started in 18th century New England where dancers come in contact with dozens of fellow dancers each dance. I’ve been contra dancing since 2008, I am the president of a contra dance organization, and my friends at the event were all contra dancers. Clearly, my social bonding, or connectedness with the rest of the dancers, is very high. Captivation – Locarno, a Latin folk fusion band that just happened to be playing near where I was eating, had me swaying along to the music completely heedless of other concerns. Intellectual Stimulation – Watching the Indian dancers from Alankrita, I found myself analyzing the specificity in performers’ gestures and considering how other dance forms compare in precision. 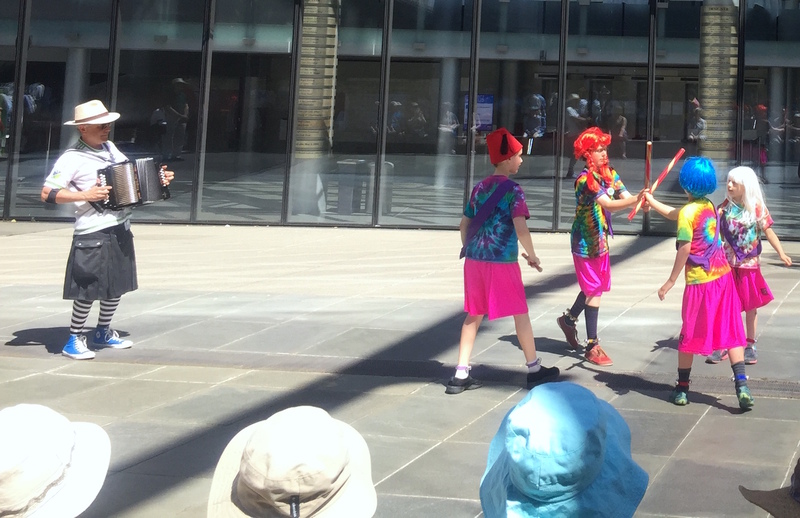 Emotional Resonance – Children performing Morris, a traditional English dance form, garnered cheers of joy from the whole audience when they caught sticks flying through the air or successfully navigated complex dance figures. Aesthetic Enrichment – When I first came to Folklife, I had never seen marimba performed live. Experiencing the passion and synchronicity of Nyamuziwa, a then high school marimba ensemble, piqued my interest. I experienced what the framework refers to as aesthetic conversion. I am now a fan of the music and make marimba performances one of my annual stops at Folklife. Social Bridging – The Circle of Indigenous Peoples Celebration presented an Aztec dancer embodied the complex rhythm provided by a team of drummers, which certainly increased my respect for and insight on the artistic traditions of a culture previously outside my direct life experience. We all know that comparing these artistic experiences is comparing apples and oranges, but all too often arts administrators are asked by stakeholders to compare the success of events just as diverse. This conversation was traditionally framed in terms of income or audience numbers, and it is only in the past ten years that we’ve been able to step beyond that and examine impact. This has allowed companies to truly frame their success in terms of mission fulfillment. Northwest Folklife’s mission is to “create opportunities for all to celebrate, share, and participate in the evolving cultural traditions of the Pacific Northwest.” Its core values articulate that both sharing your own folk traditions and learning about traditions that are new to you are essential to building stronger communities and growing cultural heritage. Looking at these outcomes, impact indicators for captivation, aesthetic enrichment, and social bonding and bridging better show success than attendee numbers or satisfaction would. While my experience is by no means representative, reflecting on the festival’s mission, I see that the variety of performances at Folklife is essential to achieving this range of impacts. The social bonding of contra dance may be what draws me to the festival each year, but it is only a part of the value of my experience. It is only by examining the range of relevant impacts I experienced that I can really describe how I am transformed by my attendance and how Folklife achieves its mission. This definition of success as outcomes based seems obvious, but this is not how we’ve been trained to talk about producing or experiencing art. Intrinsic Impact provides the vocabulary to discuss outcomes-based success, without which we fall back on overly simplified measures that often miss the complex series of experiences that together create profound impact. The motivations for presenting art are numerous, and Intrinsic Impact research has allowed our companies to define and measure success with much more nuance than traditional research methodologies. As for Folklife, I look forward to returning next year with a better sense of how the experience can be a success for me. When there is a disconnect between intended and experienced impacts, artists and administrators have the opportunity to make adjustments in how they market, present, or think about their work. As an audience member, my opportunity for change is in my behavior, engagement, and context. Making space for successful art requires listening, and with WolfBrown I have gotten to work with some of the best listeners in the field. They inspire me to listen more to my own reactions, and I know that next year I will enjoy the artistry at Folklife all the more for it.